They managed to successfully ram through a Clintonite to be the next head of their party. This shows that enough Democrats are either terminally clueless and cannot understand the mechanics of the Trump victory, or terminally craven and think risking a further slide into fascism is a price worth paying for continuing to appease the oligarchs. Either way, I have no stomach for working closer with those bastards. Yes, I realize that there’s an argument to be made for perseverance, one that is basically not refutable (since it depends so much on unknowable future events). It’s just that the chance seems so remote to me, and the need seems so profound for more revolutionary politics, that I cannot in good conscience squander my precious life energy on working within the Democratic Party. It bears revisiting the point that the Establishment left does not exist to liberate people from capitalism; it seeks to placate people with reforms so that they don’t get uppity and threaten the rule of the elites. As such, the reason that Ellison wasn’t voted in is that he serves no useful purpose to the Establishment. There simply isn’t enough viable threat of social revolution to sufficiently motivate serious attempts at reformism at the present. So the conflict between following my heart and choosing the most practical route turns out to be illusory; focusing on radical politics is the most practical route. It could be explicitly guided by the principles of white nationalism, and could be totally unmoored from any standards of decency, instead of only partially unmoored from them. It could, in other words, be much like President Bannon desires it to be. Which means that despite all his faults, someone like James Mattis is exerting a beneficial influence by retarding such new directions and clinging to historical patterns. In turn that means that if Mattis (or some other more Establishment figure) leaves, particularly if he is forced out, it’s time to get really worried. It’s real. Trumpists are whining about it and Establishment liberals are cheering it on. What’s the ramifications in this for anarchists? I think this discussion on Reddit captures many of the points. First, the Deep State, like any part of the State, is not the friend of anti-authoritarians. But second, the pre-Trump status quo is far better for anarchists than the sort of fascism Trump could easily unleash. In this, the Deep State serves much like Stalin did against Hitler: not necessarily a Good Guy, but someone who can be much more easily lived with and coped with than the Bad Guy both of us have in common. Currently, the Intelligence Community seems to be fighting Trump in the least harmful way remaining available to them: by leaking damaging facts about his regime. That allows the influence they wield to be moderated by public opinion and lawful processes. Exercising influence via leaks is greatly preferable to doing so via more overtly forceful techniques such as blackmailing, assassinations, coups d’etat, etc. The leaks are still unlawful, of course. Classified information is being released to the public without following the legally mandated formal process of declassification. But the law isn’t prefect; in fact, it’s already failed mightily by letting an authoritarian demagogue (precisely the sort of person it has intended to keep out of high office) into the White House. The crisis, in other words, already exists. By choosing to deliberately leak, the Intelligence Community is responding to an existing constitutional crisis, not creating a new one. My parents keep it very warm (about 75 ˚F) in their house. I generally heat mine to somewhere between 60 and 65 ˚F. When I’m there and awake, that is. So often it’s somewhere in the fifties because although the heat is on it hasn’t fully warmed up yet. Which made for a little bit of worrying about how uncomfortable I’d be when I returned. Answer: not much. 58 ˚F is still plenty comfortable when one is in front of a radiant heat source, wearing sweatclothes, and has a blanket handy. It’s winter, why should I dress as lightly as if it were a warmer season? 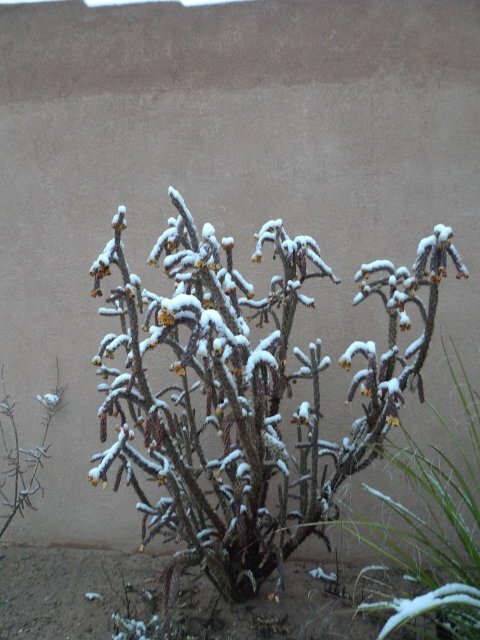 I lived in New Mexico as a teen, and learned early on that if there’s a spell of abnormally warm weather in the cooler months of the year, it typically ends abruptly. Two days ago, highs were in the 70s. Flying back to the Pacific Northwest this afternoon. I’m visiting my parents in New Mexico, and twice I’ve been struck by articles in the local paper hyperventilating about crime. The most recent one is here. In short: they’re pure crap, as shown by the actual statistics. Crime is higher than national averages both in Albuquerque and in the state of New Mexico. Things have long been such; I remember that being the case when I lived in New Mexico as a teen. Yet, I never felt personally at risk, and I still don’t when I visit. And, more importantly, the long-term trend in crime, both in New Mexico and nationwide, has been downward. Claims that “the crime rate is eye-popping” are nothing short of fake news. The Albuquerque Journal should be ashamed of itself. I’m going to be investing in some firearms soon, and thanks to most gun owners being right-wingers, I’ll probably be able to get them for less money than I normally would.